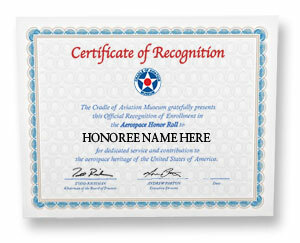 Participate in the Aerospace Honor Roll and become part of the story of aviation history. Enroll and support this great monument to the thousands of men and women who have helped forge our rich history through their participation in all sectors of aerospace. Enroll yourself, a friend, or a loved one in our online edition for a one time donation of $75. Online edition will allow you to log-in and add an Honorees name, bio and photo and will also be viewable on our kiosks in the Honor Roll Gallery. For a one time donation of $125 the honoree will also have his or her name permanently added to the Aerospace Honor Roll gallery wall. Both levels will receive a commemorative certificate suitable for framing. Aerospace Honor Roll donations go to support our education programming and preservation efforts. Please fill out the payment form below, you will then be directed to another form where you will create your Honor Roll account and enter the Honorees information. You can log back in at any time to edit or change the profile or photo. Online Membership - $75 - Includes online bio and photo, onsite kiosk and certificate. Full Membership - $125 - Includes the above, plus name added to Honor Roll Gallery wall.